Craft your own Tea Blend! Join us for a sensory journey into the world of tea blending. You will learn about pure leaf tea and we will explore the diversity in the flavour profiles of different tea styles that form the base to our tea blends. We will also look at alternate tisane bases if you prefer non-caffeinated infusions. We will continue the journey by layering a variety of organic tisane ingredients to understand the alchemy of creating balanced infusions. You will then be given access to our tea blending table to develop and create your own custom tea blend from over 40 tea bases and organic tisane ingredients. These will be packaged in a reusable glass jar for you to take home and share with your family and friends. Our Certified Tea Master will be on-hand to guide you through this process and also share tips on developing your blends and how they are best enjoyed. access and tasting to over 40 different tea bases and tisane ingredients PLUS you get to create your own signature tea blends! glass canisters containing your custom tea blends! Kym Cooper is a Certified Tea Master with the Australian Tea Masters and founder of The Steepery Tea Co.
Kym has called both Australia and the UK home and has travelled extensively throughout the world. During these travels, she immersed herself in global tea culture visiting tea houses, tea stores, tea masters and tea estates whenever the opportunity presented. Drawing upon the most interesting elements of global tea culture she aims to share enjoyable and enriching tea drinking experiences for everyone. Kym is passionate about promoting and fostering tea culture within Australia and is the South-East Queensland Ambassador for the Australian Tea Culture Seminar. The Seminar aims to bring together the Australian tea community and provide a platform for comprehensive discussion, collaboration and innovation for the promotion of leaf tea in Australia. 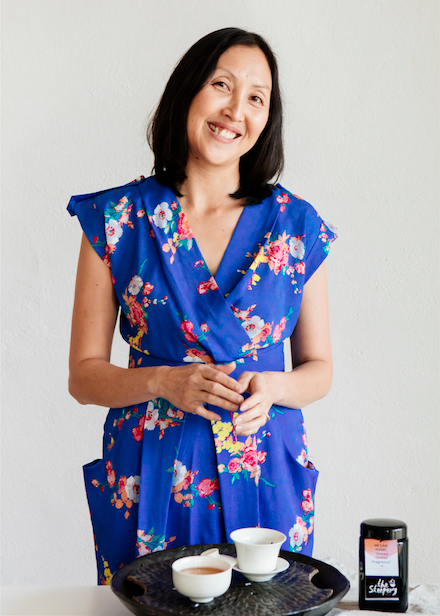 Kym is a self-confessed tea nerd and loves organising tea events for The Brisbane Tea Meetup allowing the local tea-loving community an avenue to follow their passion for leaf tea.